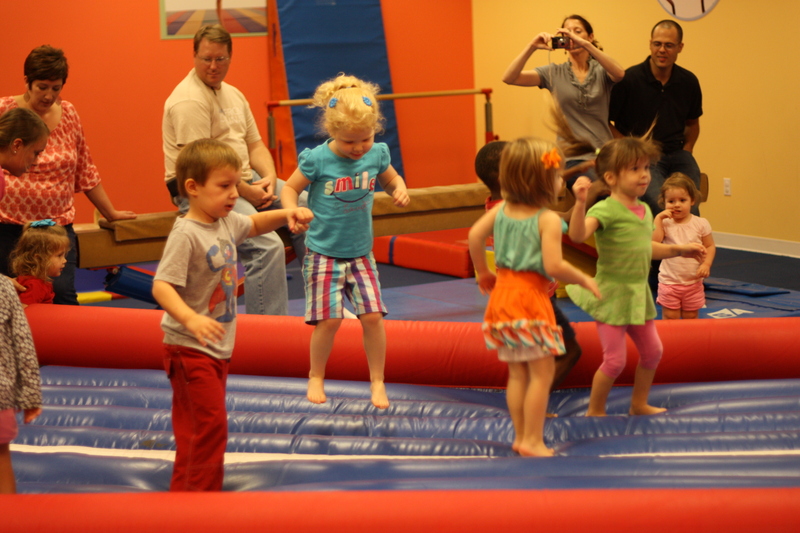 Last Saturday Carlton and our family and friends celebrated his fourth birthday at The Little Gym in Snellville. See? Smiles everywhere. Carlton and his friends had a blast. Though Carlton only took classes there for six weeks, he often asks to go back. The birthday party was the perfect excuse. The folks at The Little Gym were organized, well-staffed, professional but personal, and they made the entire experience a pleasure. We got to watch the kids have fun and take pictures while the staff ran the party. I can’t recommend The Little Gym enough. There’s a reason Parents magazine named The Little Gym the number one place to host children’s birthday parties. Along with my recent job change, I’ve changed gyms as I seek to find a schedule that makes sense for me. I’m no longer at the Fitness 19 around the corner, though I had a good experience there for several years. The BIG gym. Actually, it’s the biggest gym I think I’ve ever been in. 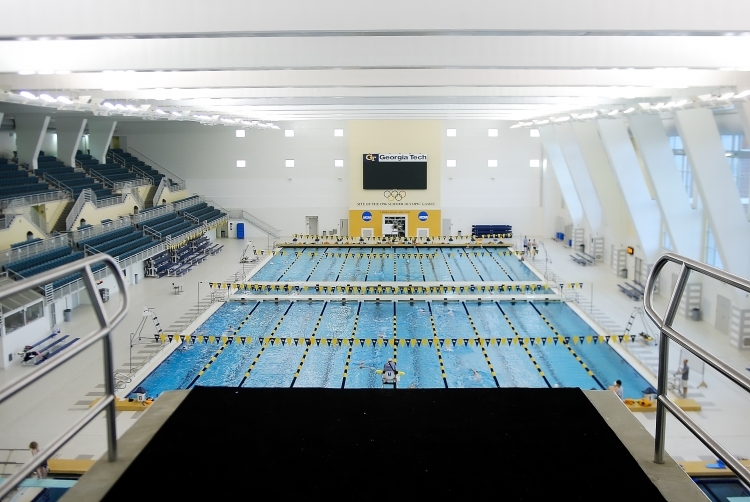 Now, I’m at the palatial Campus Recreation Center at Georgia Tech, the modified former venue of Olympic swimming and diving. It’s massive, with 14 machines of every type, and the equipment is so new I don’t even know what to do with some of it. 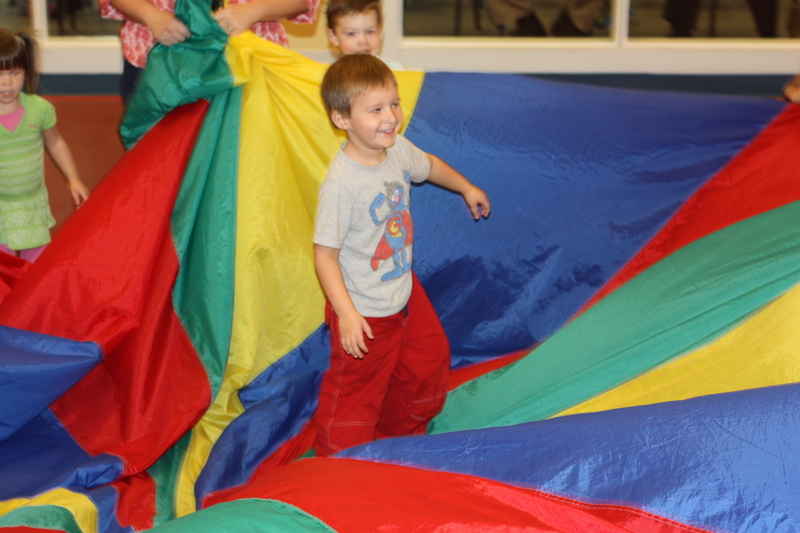 Sight: The Little Gym is full of bright, primary colors appropriate for children who are learning such basic concepts. 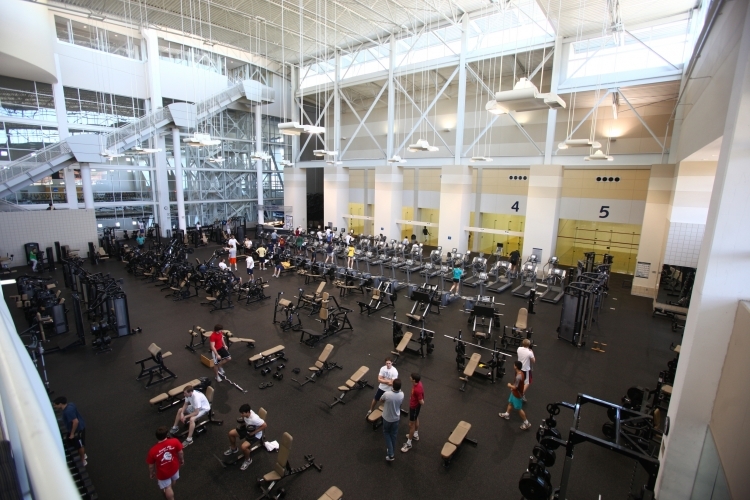 The big gym has the appropriate Georgia Tech old gold and white with the navy and black accent colors tastefully and athletically applied. Both are well lit. Obviously, the patrons of The Little Gym are quite a bit shorter but after a rousing game of follow the leader or parachute circle, no less sweaty than their larger equivalents at the big gym. The key difference? The Little Gym people have way more smiling going on. No skydiving required for this parachute, but Carlton still got a little dizzy. Smell: Without putting too fine a point on it, adults who are exerting smell bad. Children who are exerting have no real smell; unless they are so busy playing they forget to take a potty break. Both gyms smell of antibacterial cleanser, although I have to say The Little Gym has some of the “Scentsy” candle air fresheners that are aromatherapeutic–a nice added touch. Taste: When I’m at the big gym, all I have is water. It’s pretty much tasteless, unless some of my salty sweat drips down my face while I’m at the water fountain. At The Little Gym, we had juice pouches, popcorn and cupcakes. Now that is fuel for a workout! I do eat a protein bar and a banana or apple after my workout, but as far as breakfasts go, it’s lacking. Sound: Both gyms have up-tempo music playing to help you get revved up. At The Little Gym, they played a number of hits from the ‘50s and ‘60s such as “Tossin’ and Turnin’,” “Rockin’ Robin” and others. At the big gym, it’s typically a mix of hits from the ‘90s, dance tunes, and hip-hop. It’s enough to make me want my ear buds, but I tend to tune it out most of the time. Mere mortals are not allowed up on the high dive platform, but it does make for a really nice view of the big gym’s pool. Touch: Nearly everything at The Little Gym is padded. There are parallel bars, a high bar, rings and other apparatus that feel the same for the kids as they would the grownups, but overall, it’s soft place to fall, jump, tumble, flip and bounce. The surfaces of the big gym are less forgiving. There is a rubber floor, which absorbs the impact of dumbbells and barbells, and the four or five mats do offer some padding for stretching, yoga or other forms of fitness-related torture. In general, though, the big gym isn’t a place you’d want to fall down. OK, so what’s my point? All of this is obvious, you say. Well, it’s clear that kids have more fun at The Little Gym than adults do at the big gym. And I think the reasons are in my analysis above. But more than the atmosphere and the physical setting, it’s about attitude. No matter what color the walls are painted or how the place smells we can all bring a little more child-like play to our fitness. Not only would we enjoy it more, we would probably get healthier in the process. I think I need a little more Little Gym in my big gym. OK, it’s your turn. What do you like about your gym? What don’t you like? Have you had any experience with the Little Gym or places that are similar? Leave a comment below and share! This entry was posted in Uncategorized and tagged athletics, birthday party, birthday party ideas, Campus Recreation Center, Carlton, children, children's birthday parties, contemporary South, CRC, family, fitness, Fitness 19, Georgia Tech, get in shape, gym, Lance Elliott Wallace, Lance Wallace, New South, New South Essays, NewSouth, parenting, Parents magazine, Snellville, South, Southern, Southern Culture, Southern Living, Southern sports, Southerners, the Little Gym, the South, working out. Bookmark the permalink. Well… missing you at your old unassuming Fitness 19 Gym. You are now surely in the Big Leagues. I think we should expect more of your level of fitness and more of your physique.